'No rush for QE3' was Bernanke's message in yesterday's speech and this left the pre-emptive gold rally looking rather exposed. As a result, gold futures plunged below the $1,600.00 level, ending $29.47 down at $1,589.00. Judging by the overnight performance, the precious metal could have further to fall unless some bargain hunters return to the market. US crude oil joined the global rally after China announced its rate cut, as the move should help to boost oil demand in the world's second biggest consumer. However, the rally quickly reversed when Ben Bernanke failed to suggest that another round of stimulus is around the corner. Consequently, US crude oil futures finished $0.68 in the red at $84.82. Demand for gold as an alternative asset was visible yesterday after signals that the US and European central banks might try to kick-start economic growth. As a result, the precious metal settled $17.3 higher at $1,634.2, although the gold futures market retraced after that on profit taking. Along with other commodities, the price of WTI crude oil benefited from a weaker dollar, gaining $0.90 cents to $85.02. It was the impression that central banks will finally agree to push the same way that spurred buying in the energy sector. At the same time, a warning from Iran regarding talks on its nuclear program also provided support. Nonetheless, a bigger than estimated reading in crude oil inventories kept the advance in check. In reaction to yesterday's better than expected rise in the ISM non-manufacturing PMI, energy investors pushed US crude oil prices $0.20 higher to close at $84.29. However, the trading range was very tight as last week's disappointing US employment data suggests a cautious approach. The weekly inventories statistics and the ECB meeting are likely to be the top drivers for the energy sector today. Mirroring a quiet trading session for the Dow and crude oil yesterday, gold closed $1.37 lower at $1,616.90 as market participants were left on stand-by. Friday's renewed speculation that central banks will add more quantitative easing encouraged some investors to buy back into gold. If more easing does materialise, then the gold market could regain its appeal once more. We are already seeing the price of gold futures head higher this morning, with the precious metal trading at $1,635 at the time of writing. Gold prices finished slightly lower yesterday, losing $2.77 to $1,559.8, as investors remained concerned by the threat of deflation. Since the beginning of May the precious metal had followed the euro lower. However, in the last two weeks the price of gold seems to have stabilised above the $1,550.00 level. This has come despite the fact that both the EUR/USD currency pair and the crude oil market have continued to decline. There will be no chance for a breather in the energy sector as long as US economic data continues to fall short of expectations. On top of that, the weekly crude inventories statistics released yesterday showed a higher than anticipated build in crude stocks. As a result, it came as no surprise that the price of Nymex crude oil touched a new low for the year, settling $1.02 down at $86.53. For once gold prices moved higher, gaining $9 to $1,563 amid signs that the European debt crisis is worsening. The metal has risen despite the US currency seeing further strength, which should make the dollar denominated commodity look more expensive. The fear factor may have played its part, encouraging investors to look for safety in assets other than the US dollar. The energy sector really struggled yesterday, as the deepening debt crisis in Europe delivered further blows to the price of US crude oil. 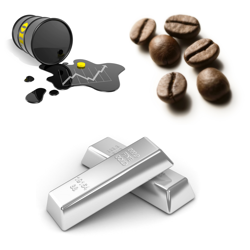 The commodity saw a nosedive of $3 to $87.82, the lowest level for more than six months. The fundamental picture, with plentiful supplies and stubbornly weak demand, is not helping matters either. All eyes will be on Friday's US employment report as it could trigger an immediate reaction in crude oil CFD trading markets one way or the other. A stronger US dollar scared away any gold bulls yesterday, and pushed the market $20 lower to $1554.6. What's interesting is that, over the longer-term, one can hardly discard the threat of inflation, given all the money that is being printed out of thin air. Holders of gold would stand to be insured against the spectre of rising inflation should it begin to materialise. Although a meaningful rebound in WTI crude prices is overdue, it is also hard for bargain hunters to step in as long as the US dollar sees ongoing demand. Yesterday, the shares spread trading markets posted a recovery but that failed to convince buyers of crude oil. As a result, WTI prices closed $0.35 down at $90.76, with investors possibly waiting for the NFP figures to give them extra clues on the short-term direction. Gold traded in a tight range yesterday, finishing nearly flat at $1,574.4, as investors remained reluctant to commit too much ahead of Friday's Non Farm Payrolls report. Although the precious metal seems to have stabilized over the last fortnight, after falling from around $1,670 in early May, it still hasn't given buyers a convincing reason to step in. We have yet to see any significant buying on the dips. Stock markets provided very limited direction for the energy sector yesterday, so the price of US crude oil enjoyed a brief rebound on the back of a stronger euro. However, it really was brief as fears over Spanish debt put the dollar in the driving seat and pushed crude oil back down. Despite a very thin trading range, the session ended $0.25 higher at $91.11. Unfortunately it's too early to suggest that the bearish momentum has eased. In the commodities futures markets, despite a slightly stronger US dollar, the price of gold moved up $14.4 on Friday, finishing at $1,572.3. This helped the metal par some of its overall losses for the week. Concerned that events in Europe might escalate at any moment, investors exited their previously short positions, especially ahead of an extended weekend in the US. It was a draw in the energy sector, as the positive influence of better than expected US economic data was cancelled out by signs of problems popping up outside of Greece, i.e. in Spain. The spread trading charts indicated a slightly higher close for the WTI crude oil market at $90.86, but that was inside the daily range. As mentioned, today's trading is expected to be thin, so watch out for any possible spikes.